Slip under the road bridge at Quorn and step back in time... period music plays from the radio, the newspapers on the table bring you the latest news from the war effort - but fortunately you won't need a ration book! 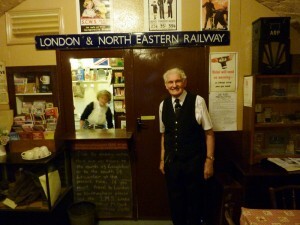 Quorn and Woodhouse stations delightful tea room will take you by surprise. Entered through a recreated air raid shelter (and it was in this room the local home guard used to meet) you'll find yourself transported back decades. The tea room is presented in NAAFI style (Navy Army and Air Force Institute) - the organisation which still runs recreational facilities for service personnel. Open at weekends when trains are running, you can sip a cup of tea or coffee, grab a snack and warm yourself by the fire. Wait for your train - or just hide away and escape. Remember though, careless talk costs lives! In the lobby entrance to this room, don’t miss our Lost Property corner, for which you will need a certain sense of humour! When the NAAFI is closed, or if you would like a meal at Quorn station, why not try the Butler Henderson tea room?